The invention of a new material called Silver Clay has opened up new business opportunities for young Mums and people that require the flexibility of a job that can be fitted in around their families and their busy lives. Recognising this potential a number of companies now offer business packages and franchises to help individuals set up their own fingerprint business. These packages tend to be very expensive and require a large amount of initial outlay with the promise of large returns on investment. Whilst I am sure that these companies are experienced in what they do they are not necessarily the only option for people wishing to work for themselves. 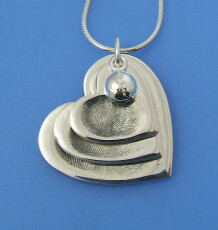 Why Learn Fingerprint Jewellery with us at Learnsilverclay? Quite simply because we've been doing it for years... 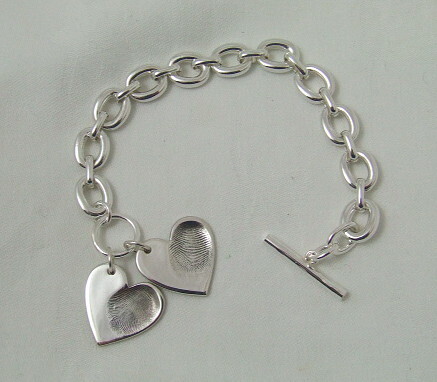 Courses are taught by Paula Louise Paton who has been in the jewellery business for more than 18 years and making and selling Fingerprint Jewellery for 11 years. 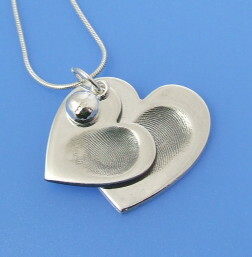 Paula runs her own jewellery business and also runs the successful Sussex based Learnsilverclay teaching studio which has been teaching courses in Fingerprint Jewellery for 11 years. Paula continually updates the course content to stay abreast of new techniques. Learnsilverclay also runs a variety of workshops and classes suitable for beginner, intermediate and advanced metal clay artists. Visit the main website by clicking on the link in the left hand margin. 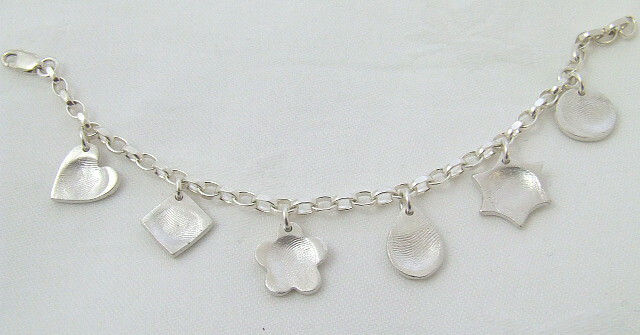 Learnsilverclay is ideally located in Mid Sussex which gives easy access to London and the South Coast. Within easy reach of Brighton, Burgess Hill, Hayward Heath, Horsham, Crawley, East Grinstead, Tunbridge Wells, Crowborough, Worthing, Uckfield, Seaford, Eastbourne and Lewes. Also, located 20 miles from Gatwick Airport makes and easy trip for our students that have joined us from far and wide including Ireland, Portugal, Switzerland, Dubai and even as far away as Bolivia, Canada and South Africa. If you need help finding local accommodation just drop me an email or give me a call. For taxis from Haywards Heath contact Roadrunners on 01444 420004 as we have found they are the most reasonable but need to be pre-booked. Supplier information for boxes and packaging, kilns, tumblers etc. On completion of your course you will receive a Learnsilverclay Certificate in recognition of your achievement. You will also have the opportunity to purchase a Fingerprint Starter Kit of specially selected products. It includes everything you will need to get you started producing professional quality fingerprint jewellery and you will be taught how to use all the tools and equipment on the course. You will benefit from 5% discount on the Starter Kit should you wish to purchase it and also on all your future purchases from www.pmcshop.co.uk which will all help to get your new business off the ground. PMC Shop is also owned and run by Paula, it stocks one of the largest ranges of Metal Clay tools and equipment in the country and has a specific category dedicated to Fingerprint Jewellery Supplies. This course has been designed and extended to enable you to produce fingerprint jewellery to a professional level and keep you up-to-date with the latest techniques in the business. 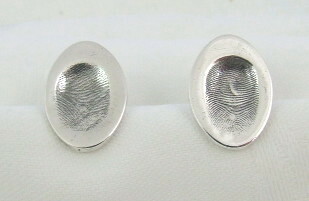 For an example of what you can expect to achieve after attending this course and a small amount of practice see the fingerprint section on Paula's jewellery website www.paulalouisepaton.co.uk. You will learn how to take fingerprints directly into the clay and also how to use moulding compounds to enable you to sell your fingerprint jewellery online. You will learn how to solder fine silver and sterling silver fittings together. Add text by either scribing or stamping and much more. 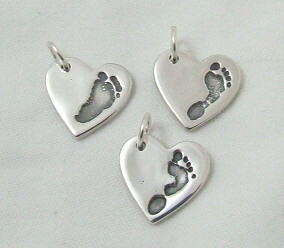 We have now extended this course to include the processes involved in producing Hand and Footprint and Childrens Artwork images on silver using Photo Polymer Plates. 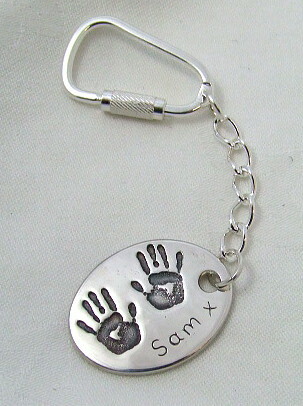 Childrens Artwork and Hand and Footprints are becoming increasingly popular and once learnt the techniques can be used to reproduce any black and white image onto jewellery. For example these techniques can be used to produce Cat and Dog Paw Prints, Kiss Imprints, Dog Nose Prints, Baby Scan images.... the options are endless. We will also discuss the techniques for adding gold to your jewellery to increase it's value and reach a wider market. 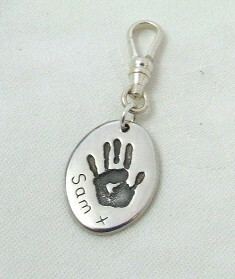 We will cover stone setting in silver clay (everyone likes a bit of bling) and how to colour hand and footprint charms with UV resin. We will be looking at and using both brands of Silver Clay, PMC (Precious Metal Clay) and Art Clay Silver and discussing my experience using both products. The two days will be packed with invaluable information for those wishing to create Fingerprint Jewellery as a business as well as those just wishing to produce jewellery for themselves, family and friends to a high standard. 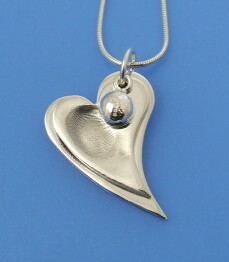 For full details of the course syllabus email Paula at info@learnsilverclay.co.uk. The course includes a massive 46g of silver clay, a pair of sterling silver hinged cufflink fittings and sterling silver keyring fitting, cubic zirconia's for stone setting and the use of all resins (over £140 worth of materials). Don't forget everything you make on the course can be used as your marketing examples. This course has been designed to be suitable for all levels. Whilst it is beneficial to have worked with metal clay it is not a pre-requisite to attend. The course is comprehensive and covers all metal clay processes from start to finish. Producing photopolymer plates will required some basic computer knowledge. You will need to be able to scan an image onto your computer and make some changes to the contrast and resolution before printing it out. Due to time constraints and the variety of different computer systems, printers and software available it would be impossible to cover this part of the process successfully and make it relevant to every students home computer/printer. You will therefore be using sample images on the day which have already been printed out. We understand when setting up your business that cash flow is important so we don't ask for the full course fee up front, just a £50 deposit to secure your place. 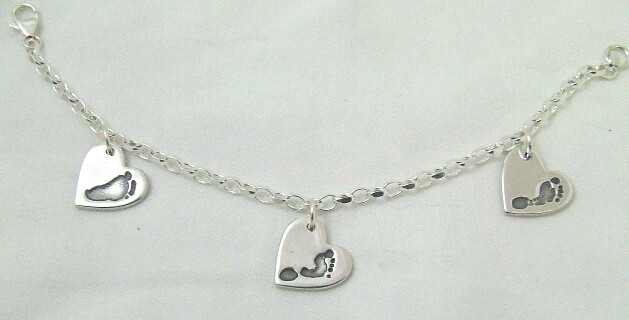 See the Learnsilverclay website for full Booking and Cancellation Terms. Jo: Dear Paula, Firstly can I take this opportunity to thank you once again for the exceptional weekend fingerprint course that I attended at the end of July. Not only was it lovely to meet a wonderful bunch of likeminded people it was undoubtedly your expert and knowledgeable teaching that made such a difference to me. Having played around with Art Clay for the last year having fairly reasonable results I was staggered and amazed how beautifully my pieces came out once I changed to PMC+ and being shown how to finish items correctly. I now feel proud to be able to charge money for my work. So thank you so much Paula. NDW from West Midlands : Just wanted to say that with the skills learned on the course, I was able to finish the prints I had made a year earlier of my Dad and get them through from the dry clay stage to polished pendants! My Mum and Sister were so pleased with them especially as it was just over a year after he'd died, so they weren't expecting them. Tania: Hi Paula, Thanks for a fantastic two days at your workshop. It was inspiring to say the least! 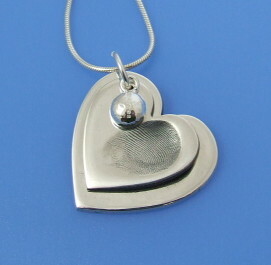 Margie: I researched loads of workshops and courses before deciding on Learnsilverclay and I really wasn't disappointed. It covered everything I needed to know and even things I didn't realise I needed to know! It was great learning from someone that has actually put it all into practice. Can't wait to get started. Thanks for everything. Debbie: Absolutely fantastic! Covered everything that you need. Lisa: What a great course, I shan't be recommending it to anyone local to me, that's for sure. Thanks for all the tips on the business side of things too. Can't wait to get stuck into my Starter Kit. Paula you're a star! Janika: Great course, very informative, covered not just techniques but also business tips. I really enjoyed the day and can't wait to get started! Lucy: Great course, loads of helpful information. Friendly atmosphere and great question answering time. Really enjoyed myself. Leanne: Excellent course, really helpful and lots of useful information. Thank you so much! Valerie: Another lovely day, learning in a beautiful setting. As always Paula was an excellent host, parting with lots of additional knowledge and empowering us to make some very beautiful fingerprint jewellery to start us on our way with our fledging businesses. Despite arriving in pouring rain by lunch time the sun shone and we could all enjoy the tranquility of the garden for lunch. The day flew by and we were relucant to leave and all agreed that the day had been very successful and motivating. Julie: I've been to loads of workshops and classes in my time and this is quite simply the best course I've been on. The course content and techniques learnt far exceeded my expectations and Paula's always happy to part with her knowledge on how to do things the easy way but still achieve fantastic results. It was a very relaxed and friendly group and we all felt inspired to get cracking on our new business ventures. Thanks Paula.